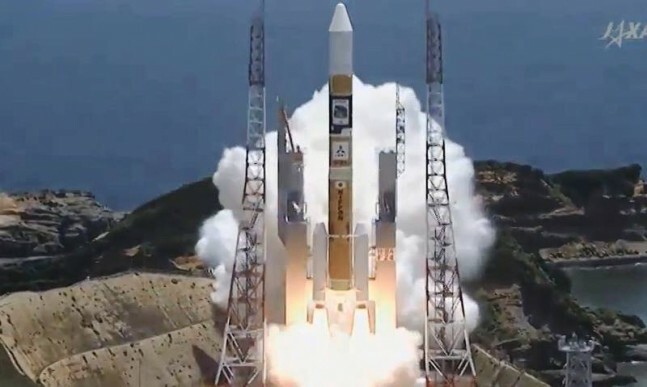 Japan Aerospace Exploration Agency (JAXA) celebrated its second successful launch of 2014. The H-IIA launch vehicle successfully lifted off from the legendary Tanegashima Space Center right on schedule at 12:05 Japanese local time (0305 GMT). The payload for this mission was the Daichi-2 (ALOS-2) radar imaging satellite and will be used for disaster monitoring and environmental research. 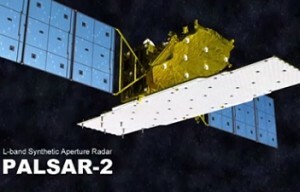 This mission is a continuation of ALOS-1 launch in 2006; however, Daichi-2 will be used for radar imaging only and ALOS-1 had both radar and optical capabilities. ALOS-1 was designed with a three year life span and a planned two year extension; it surpassed both expectations, but it had a defective primary optical imager which resulted in many low quality images. A third mission, ALOS-3, is in the works for a 2015 or 2016 launch, but the project has not yet been funded. For the current mission the ALOS-2 spacecraft is equipped with a pair of solar arrays, weighs around 4,670 lbs (2,120 kg) and has a five year life expectancy with a possible two year extension. Its two antennae, an X-band for direct communications and a ka-band transceiver to relay data to the Kodama Data Relay Satellite, were both launched in 2002 and are responsible for delivering data back to Earth. The Phased Array L-band Synthetic Aperture Radar 2 or PALSAR-2 is the primary instrument aboard the ALOS-2 and is an improved version of its predecessor. PALSAR-2 operates within the l-band of the electromagnetic spectrum at wavelengths of 9.02 inches (22.9 centimeters) and radar emissions between 1,500 and 3,000 pulses per second. Its antenna spans 32 feet by 9 feet (9.9 x 2.9 meters) with a mass of 1,448 lbs (656.8 kg), emitting 6,100 watts of power. It is capable of providing strip mapping or a high-resolution steerable spotlight beam, able to to pointed in different directions at angles of up to 30 degrees. The spotlight mode enables the satellite to produce more images with a radial resolution of 3 feet by 10 feet (approximately 3 meters), while the strip mapping mode yields resolutions of 10-33 feet (roughly 3-10 meters). It also comes equipped with a scanning mode, able to scan a 217 mile (350 kilometer) area at a resolution of 330 feet (100 meters). Daichi-2 is also equipped with the Compact Infrared Camera (CIRC), built by Mitusubishi Electric and will be used primarily for detecting wildfires. A second CIRC instrument is scheduled to be delivered to the International Space Station (ISS) and will be installed outside of the Japanese Kibo module. In addition, Daichi-2’s Space-Based Automatic Identification System Experiment 2 (SPAISE-2) is composed of an Automatic Identification System receiver (AIS) and will collect and relay signals from ships with the capability of receiving up to four messages at the same time. ALOS-2 was not the only satellite hitching a ride aboard the H-IIA, it was joined by four other satellites. Nihon University built the Space Research On Unique Technology (SPROUT), a 16 lb (7.1 kg) nanosatellite. SPROUT is carrying the Inflatable Membrane Structure System, a deployable structure used as a passive deorbit device. SPROUT is also carrying a small camera and amateur radio to take pictures of the Earth. The SpriteSat-1 mission was launched in 2009 originally and gets a reflight with Tohoku University’s Raijin-2, after the original on board computer malfunctioned. It will be used to observe upper atmosphere electrical discharges associated with thunderstorms. Wakayama University’s University International Formation Mission (UNIFORM) will monitor our planet’s surface for wildfires, relaying any fire data to emergency services in near-real-time. It will use a combination of infrared and visible-light to identify fires, and then ground teams will verify the data. Weighing in at 106 lbs (48 kg), the Space Optical Communications Research Advanced Technology Satellite (SOCRATES) is carrying a Japanese National Institute of Information and Communications Technology laser communications experiment. Built by Advanced Engineering Services, SOCRATES will validate the satellite bus and operate its Small Optical Transponder (SOTA). 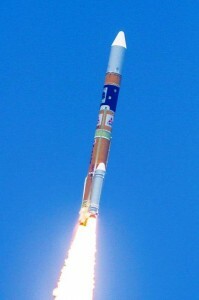 Daichi-2 and its secondary payloads were launched aboard the H-IIA F24 rocket. Saturday’s launch, conducted by Mitsubishi Heavy Industries, marked the twenty-fourth H-IIA to fly and the thirty-fifth overall H-II mission. Flying in the popular 202 configuration, the rocket’s core stages utilize cryogenic propellant (liquid Hydrogen and liquid Oxygen). An LE-7A engine powers the rocket’s first stage, while and LE-5B powers the second stage. Two SRB-A3 solid rocket motors will provide the necessary thrust at liftoff and then separate during the early portion of the mission. Introduced in 2001, the H-IIA has quickly become the primary rocket in the Japanese fleet, carrying payloads for many organizations including JAXA, the Japanese military, and even Canada’s Telstar-12V in 2015 as well as JSAT Corporation’s DSN-2 in 2017. H-IIA’s versatility allows it to fly in four different configurations depending on payload requirements. The 202 configuration utilizes two SRB-A motors, while the 204 configuration requires four SRB-A motors. Both the 2022 and 2024 configurations use two SRB-As and adding either two ro four Castor-4AXLs. The last flight of the H-IIA 2024 was in 20085 and carried the Kizuna communications satellite, since then all H-IIA launches have used the 202. Kiku 8’s December 2006 launch was the only launch the 204 configuration was used for; however, it is slated for use on the Telstar mission next year. As scheduled, the H-IIA F 24 mission launched from Pad 1 at Japan’s Tanegashima Space Center’s Yoshinobu Launch Complex. This complex was built in the early 1990s and has been used by every H-II mission, with the first one launching in February 1992. In 1999, the H-II was retired due to budget and reliability concerns. Two years later the H-IIA took its place, and a second pad was built with the powerful H-IIB launching in 2009. Historically, H-IIA launches exclusively from Pad 1 and H-IIB from Pad 2, even though the H-IIA vehicle can launch from either pad. All rockets are assembled vertically in a vehicle assembly building slightly northwest of the pad. Friday night, after receiving final approval at approximately 19:35 JST (10:35 GMT), the H-IIA rocket left the assembly building and began a 25 minute rollout at 23:00 JST (14:00 GMT) with countdown commencing just after 02:30 JST (17:30 GMT). The launch began right on schedule with the LE-7A engine ignition, followed by the firing of the two SRMs. After leaving the pad, the H-IIA F 24 performed a series of planned maneuvers to ensure proper trajectory for a sun-synchronous orbit. The first stage went on for six minutes and thirty-six seconds, with SRM burnout occurring at 115 seconds and motor separation occurring about nine seconds after that. Approximately four and a half minutes after liftoff, the payload fairing was jettisoned. After LE-7A shutdown, the vehicle coasted for 12 seconds before separation. Then the second stage fired up six seconds later, and burned for eight minutes and twenty-four seconds. Daichi-2 was officially in its intended sun-synchronous orbit at an altitude of 390 miles (628 kilometers, 339 nautical miles) fifty seconds later. Just under nine minutes after separation, secondary payload deployment occurred. Raijin was first followed by UNIFORM, SOCRATES and SPROUT all deploying at four minute, ten second intervals. Thirty minutes after liftoff, Daichi-2 stabilized its altitude, deployed the solar arrays and aligned itself toward the Sun. About eith hours later, it reoriented itself with the Earth. Thirteen hours after launch, deployment of the PALSAR-2 antennae will begin, a twenty hour process. 37 and 47 hours into the mission, the two antennae will be deployed and the spacecraft will be in operational mode. Approximately 51 hours post launch, spacecraft and instrument checkout and testing will begin.